Fiji's efforts to record their first ever victory over England at the seventh attempt were not helped by standoff Nicky Little and centre Waisake Sototu losing their battle with injury and, after being posted in the match programme, only starting from the substitutes' bench. It's an ill wind that blows no good, but it was a chill wind that did for the Fijians handling skills today. A host of uncharacteristic mistakes, especially in the first half, meant that the islanders were always playing catch up rugby, and they never quite managed to overhaul England's early lead. Robbie Williams boomed out, "Let Me Entertain You" as part of the pre-match entertainment and with Waisale Serevi pulling the strings at flyhalf there was every chance of it. Indeed Fiji realised that they could not combat the England forwards and they showed far more enterprise than they did against France. 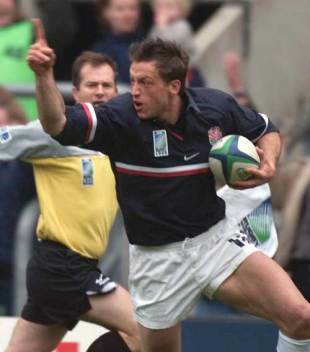 However Serevi's opposite number, Jonny Wilkinson, dropped the start right on top of the little magician who promptly spilled the kick. Three early penalties, two from Wilkinson and one from Serevi, calmed what had been a frantic start to the match. The Fijians had pulled a ball back into a scrum and strayed offside, England had dived into a ruck. England enjoyed the better of the first quarter. They ran the ball at Fiji who were forced onto the back foot from the off. Wilkinson had already missed a kick when "Fat Joe" Veitayaki was penalised at the set scrum,and the young fly-half made amends in the thirteenth minute. Newport lock Raiwalui was guilty of obstruction at a lineout. Both Wilkinson and Healy used the boot cleverly to turn and pin Fiji into the bottom left hand corner from which the islanders were struggling to escape. The number ten also sold a beautiful dummy as though to show that Serevi had no monopoly on skills. Fiji were slowly edging back into the game when they were scuppered by a bolt from the blue shirt of Dan Luger. Wilkinson saved an errant pass midfield and Neil Back quickly moved the ball to his left winger. Luger set off like a scalded cat, passing Ifereimi Tawake before outpacing the covering Uluinayau to score under the sticks. Wilkinson's conversion gave England a 16-3 lead close to the thirty minute mark. The island underdogs immediately bared their teeth. A wayward kick from Mike Catt allowed centre Viliame Satala and Alfred Uluinayau to mount a counter attack that was only halted when prop Dan Rouse was dragged down short of the line. Nick Beal was forced to prevent release of the ball five yards from the England line, for which heroism/cheating (delete accoring to sympathies) he was shown the yellow card. Wingers Vunibaka and Tikomaimakogai then both spilled the ball agonisingly with the line at their mercy as the cold day hurt their handling and England needed their "get out of jail" card. Indeed the former was over the line before losing control and England breathed a sigh of relief as Wilkinson was finally able to clear to the halfway line. Moments later and totally against the run of play, Neil Back had crossed for England's second try. Mike Catt and Martin Johnson had run the ball deep into the Fijian twenty two. When the ball came back to Wilkinson he launched a sky-rocket to his left wing where Back beat Vunibaka to the catch before flopping over the line. Again the Fijian response was brave. Time and again the islanders eschewed the kick at goal and ran the ball at the blue shirts of England. "Fat Joe" Veitayaki saved another certain England try by diving onto Catt's chip kick near is own line. The half ended with Fiji throwing caution to the wind and the ball to all corners of the ground as they desperately saught a chink in the English armour. England deserved to be up at half time but by nothing like the eighteen point advantage they enjoyed. England, with Dawson and Hill on for Healy and Worsley, enjoyed whatever wind was blowing down the pitch in the second half. This breeze helped Wilkinson extend England's lead by another six with two penalties, from forty eight and thirty yards respectively, early in the second half. Fiji finally unpicked the England lock and it was thanks to their two substitutions. Fullback Uluinayau, easily the most ellusive back on show, twice broke the first line of defence. Then Nicky Little dummied before feeding fellow sub Inoke Male who put centre Viliame Satala over the line. Little converted and England's lead was down to seventeen. Wilkinson immediatley grabbed three back after some powerful driving from Martin Johnson and Tim Rodber, on for Archer, and the second half was still only twelve minutes old. If there was still any question about the final victor Nick Beal soon put the doubters right. Dallaglio made the early impact with a backrow move and Dawson tapped a quick penalty. The ball was moved right via Wilkinson and Perry for Beal to elude Tikomaimakogai in the corner. The Fijian winger showed his attacking skills were better than his defensive ones just a minute later. Mike Catt made a pig's ear of a Sototu kick, albeit under pressure, and the big winger picked the bouncing ball for a simple run in. Little's conversion was answered by another Wilkinson penalty, which was his last action of the match as he staggered off the field shortly after. The young flyhalf had been hit late by Fiji skipper Greg Smith while giving Phil Greening a scoring pass. Dawson made the simple conversion and the home side was threatening to cut loose in the final fifteen minutes. It was Fiji who were unlucky not to score next as their flankers Tawake and Sewabu combined down the left wing. Centre Meli Nakauta then got the consolation score and Little conversion made the score a highly respectable 45-24. England's victory was rarely in doubt but with injuries to Healy, Perry and Luger this win may yet prove hard won with tougher tasks to follow. The Fijians did a lap of honour at the end of the match and that was the least they deserved for their efforts. Their coach Brad Johnstone can pick up his pipe and slippers and reflect on some proud moments.